One of the most successful online players who shows us he is really good at live games as well, Patrik Antonius sure is someone you don't want to find against you at the poker table. There are not many players as talented as he is in both online and live poker. Patrik Antonius was born on the 13th of December in 1980 in Helsinki, Finland. Patrik was playing soccer, tennis and hockey when he grew up. When he was 13 he decided to focus only on tennis and become a professional tennis player. As soon as Patrik graduated from Helsinki Business College he served in the Finnish army, which was tough for him. Luckily enough he was granted the privilege of playing tennis when they were on base as he was in the Army Sport division. After 6 months in the army Antonius was ready to start playing professional tennis tournaments, but a terrible back injury shattered his dreams of becoming a pro. Patrik had discovered poker when he was eleven, and now that he couldn't play tennis he decided to focus on poker instead. With a couple of friends they started to play poker in his backyard, then at the tennis club when Patrik was 14, and in high school they had to move it back to their houses because the game got too big. When Patrik turned 18 he discovered poker in the casinos, the first time he entered the $25 no limit tournament held at the Casino Helsinki, he won, taking home $275. By playing home games he made enough to keep playing poker at the casino, even though he went broke a few times. Finally all the practise with his friends paid off, and Patrik managed to build a healthy bank roll. In 2003 he made a $200 online deposit and in just 2 months Patrik managed to get gis account balance to $20,000. Especially the idea of being able to play at any time he wanted and more than one table got him hooked. Patrik decided to take a break from Polytechnic college and study the game and his opponents even more. By playing 12 hours a day, seven days a week his bankroll grew from $20,000 to $80,000 from March 2003 to December 2003. Patrik wanted to play the best online players, in the biggest games to learn how they won, and his understanding of the game improved even more that year. In the meantime his back was getting a lot better, and seeing a lot of his Finnish tennis friends playing tennis in American universities, Patrik thought that would be a great experience for him as well. Even though attending classes and playing tennis kept him from playing more than 1-2 hours a day, Patrik was on a roll. By playing $50-$100 limit hold'em, mostly heads up and short handed, he managed to win $150,000. Patrik also played $5-$10 and $15-$25 pot limit omaha and his bankroll was now close to $250,000. After winning an online sattelite for the WSOP Patrik was on the first plane to Vegas as soon as school was finished. There he met some great players, who gave him a huge confidence boost by saying he really should focus on his poker game, because they thought he was very talented. After the WSOP Patrik headed home to Finland, ready to take on the poker world. In 2 weeks he doubled his bankroll again by playing $200-$400 limit games online, putting his focus on short-handed games. 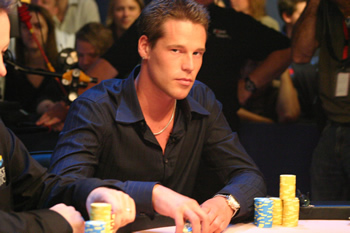 2005 was a great year for Patrik, in August he won the Ladbrokes Scandinavian Poker Championships in Stockholm. In September he finished 3rd in the EPT Barcelona for $145,000. In October he won the EPT Baden for $343,000. And in December he finished 2nd in the WPT at the Bellagio for $1,045,000. Together with Jamie Gold Patrik was involved in the biggest pot ever of GSN's High Stakes Poker. It totaled $743,800. He is living in Vegas since January 2006, actually living in the Bellagio for 12 months. (Quite handy when you're a regular in the Big Game there). Now Patrik is living with his fiancée and his baby girl.